If you know me you then you know I love a good party. 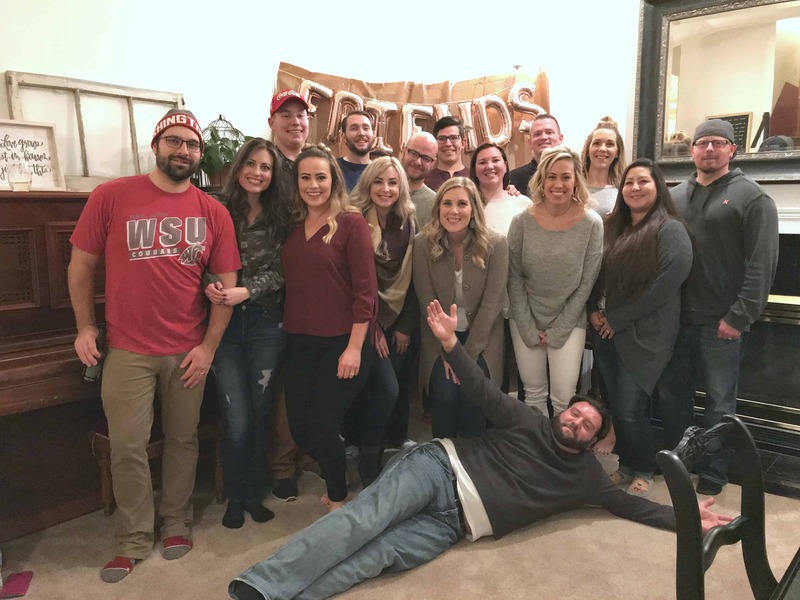 When I first heard of Friendsgiving my mind was blown. What? Thanksgiving? But with friends? How fun! Back then though, my home was too small so I waited. Fast forward to this year in our new place. I was ready to throw one heck of a Friendsgiving. I’m here to share my tips, what to do and what not to do, and the food you can’t forget! (learn from my mistakes!) 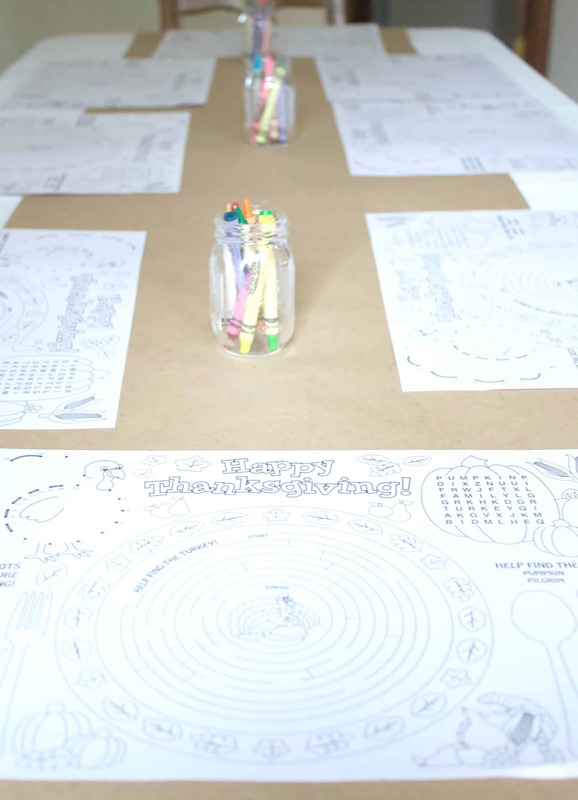 Also included is a DIY tutorial for our Friendsgiving banner, as well as some free printables to help you on your way! Grab a pen and paper, and get ready to take some notes! Most of us attend traditional Thanksgiving yearly. Friendsgiving isn’t meant to take over Thanksgiving, but rather give you the opportunity to celebrate this fun (and yummy) holiday with even more of your favorite people. Because the holidays get crazy and everyone has plans, I thought it was best to host Friendsgiving early in the month. Some people are already attending two Thanksgivings, with the first one often the weekend before Thanksgiving. I kept the invites super casual and used Facebook. The invite went out towards the end of October. I wanted everyone to have plenty of time to plan and it worked really well. We only had a few who couldn’t make it. Friendsgiving shouldn’t be stressful. We decided to do potluck style where everyone contributed a dish or two. Before assigning out food I asked in our FB group if anyone had something they really wanted to bring. Most people had a favorite side dish, appetizer, salad, or dessert that they were willing to make. Those that didn’t respond to our thread I messaged individual and asked to fill in the gaps. That worked great! 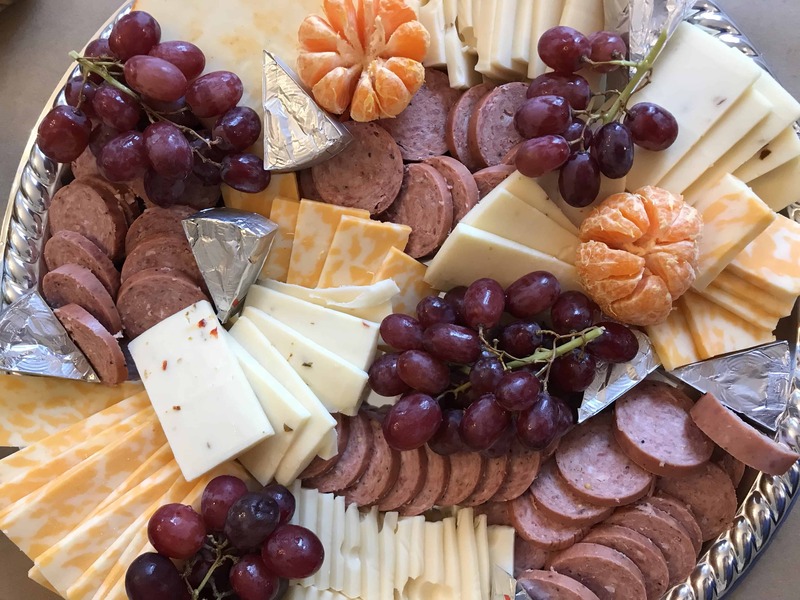 I had a list going of all the food and once everyone was written down for something I went through and wrote myself in for the necessities such as stuffing, ham, green bean casserole, a cheese platter, and apple pie. 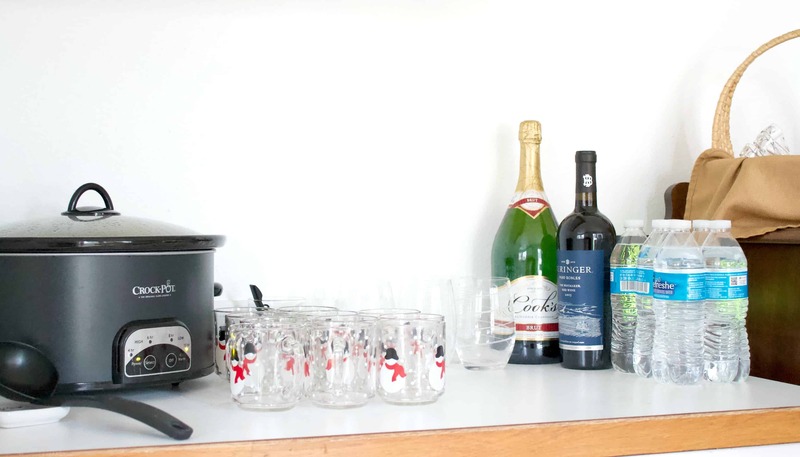 Each couple was also encouraged to bring any alcohol they wanted to drink for the evening. I provided my mom’s famous wassail. This was seriously the hardest part for me. I was making most of the cooked dishes that needed served warm. My stovetop was pilled high with stuffing and casseroles I was trying to keep warm while the ham was cooking. Next year I’ll try assigning some of the cooked dishes to others so they can bring them just out of the oven, and I won’t have to stress and re-warm food right before serving. I told Travis when we remodel our kitchen we’re getting double ovens! Thank goodness one of our friends offered to bring the turkey, otherwise I would have served cold ham! I knew I wanted a little statement area where people could gather and snap photos. 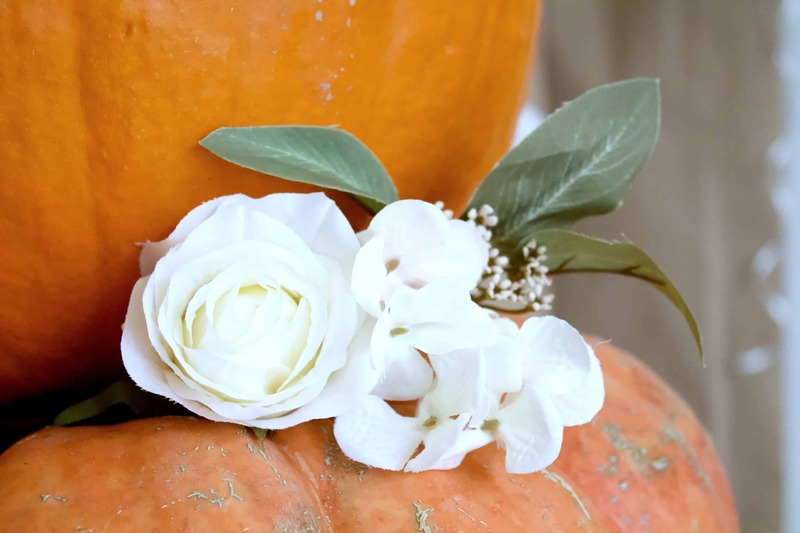 You don’t have to go all out with Friendsgiving decor, but, I love to go all out everything. 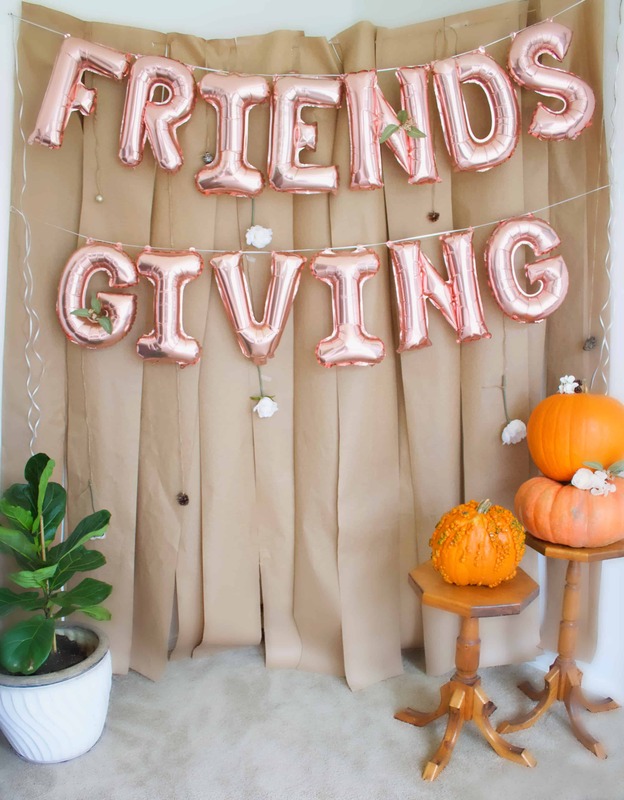 Even if you don’t though, this Friendsgiving banner is perfect because it makes a bold statement, didn’t take more than 45 minutes to assemble, and the cost was very minimal. I ordered the craft paper, twine, and Friendsgiving balloons off Amazon. The flowers I found on clearance from Michaels. Find an area in your house to accommodate the banner. Make sure to hang it high enough so even the tall people can get into the pic. Measure from where you want it to hang down to the ground. 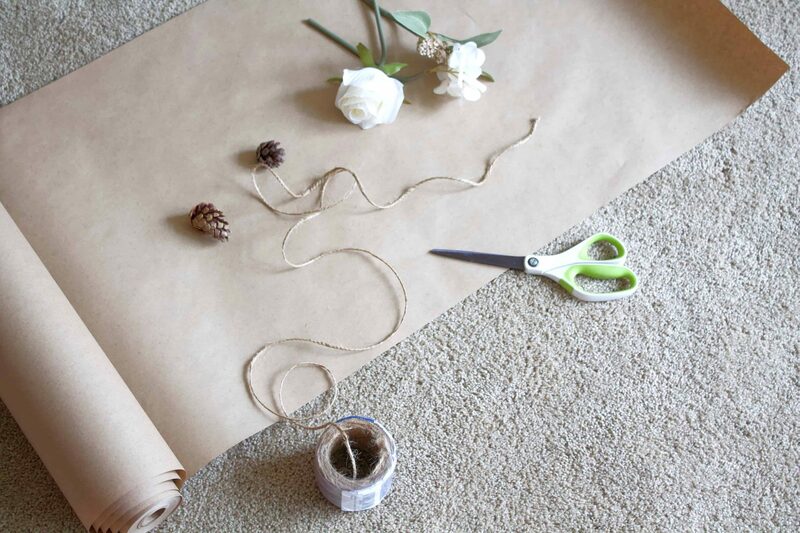 Roll out the craft paper to the correct length and cut as many pieces as you need. For our corner it was about five pieces. Then, cut each piece lengthwise making two, smaller pieces. String the twine through the tops using a large needle or just poking holes in the paper and threading the twine through after. 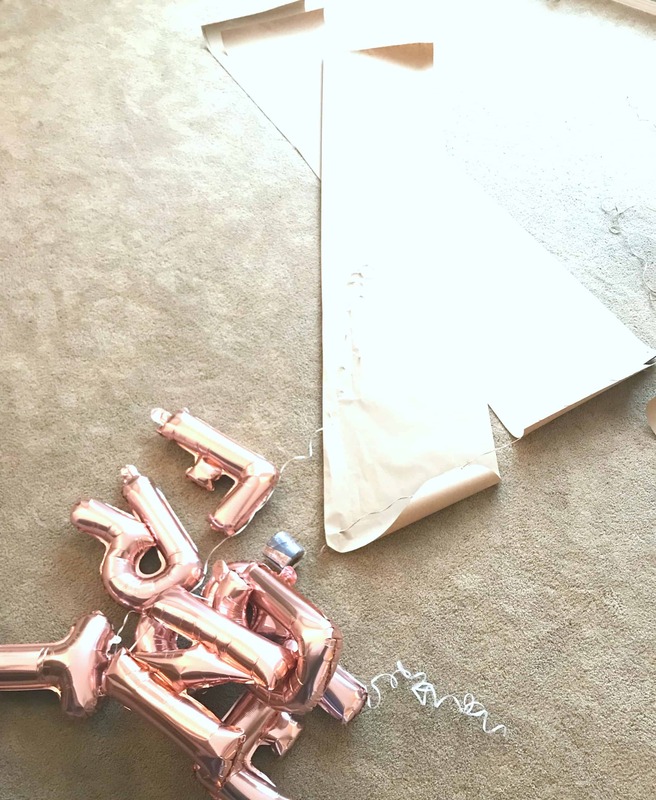 Once all the balloons are inflated string them up using the string provided. Pin them to the walls. I took the flowers, a few small pinecones, and strung them from the sign. This really isn’t necessary because people are going to be standing in front of it for the most part. But, I liked it for simply looking at throughout the party. 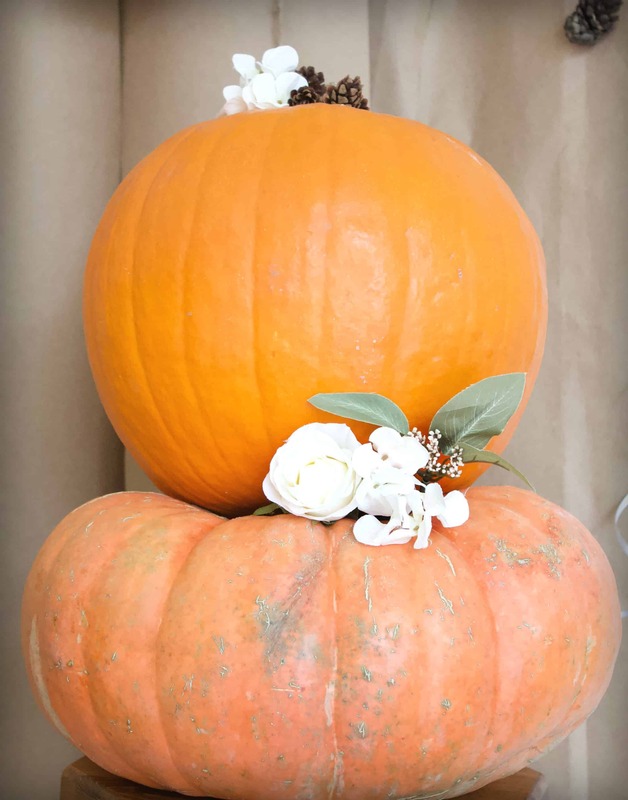 For a little extra fluff I added the pumpkin cake on the side, (a stacked set of pumpkins with flowers thrown in) since it’s been all the rage this year. I placed my fiddle leaf fig on the opposite end of the banner to balance it out. I also wove some of the floral accents into the letters. It was a fun little blend of contrasts. And just like that, done! 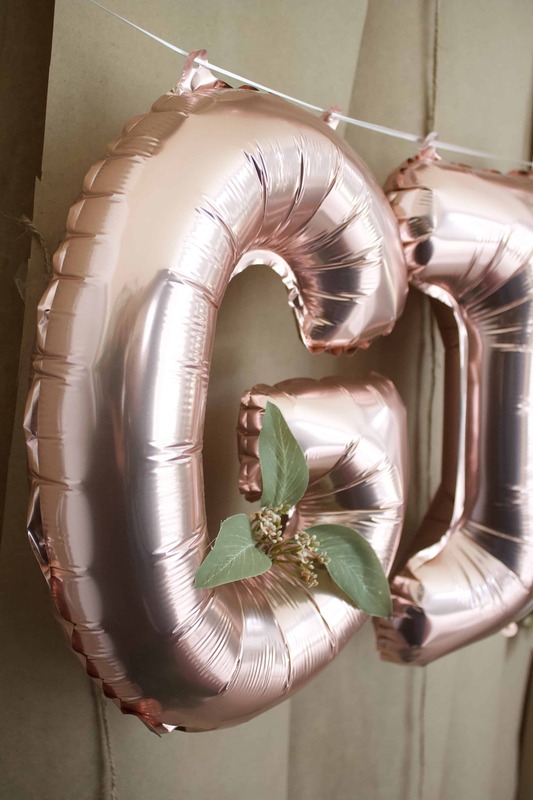 Simple and quick banner but adds a lot to your party! I wanted everyone to feel welcome to bring their kids. I made a children’s table downstairs and while shopping the day before found fun kids activity placemats by the greeting card section at our local Fred Meyer. They were such a fun little addition to their designated spot. 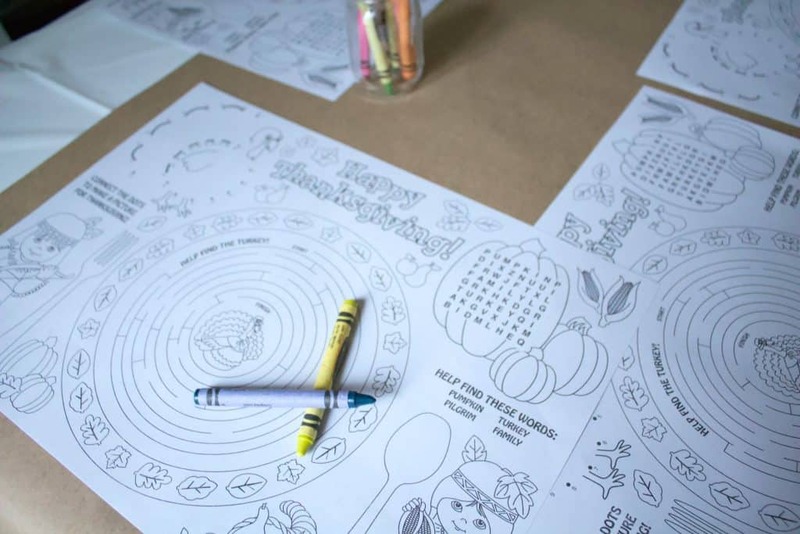 While these exact placemats are currently unavailable on Amazon, these placemats are also fun. Dinner – and don’t forget the mashed potatoes! Dinner was a little late due to the fact that my ham was slightly frozen when they gave it to me and I had no idea until too late. I put in the first order of flame crafted ham at our local Fred Meyer and they weren’t quite ready to start busting them out yet. Oops. Live and learn! Thankfully my brother in law is an amazing cook and he took over in the kitchen. Thank you Dustin! Tip: Head to your local butcher and make sure a week or so ahead of time they have what you’re looking for. Again, learn from my mistakes. Thankfully we had LOTS of appetizers to hold us over until dinner was done. Speaking of mistakes. I didn’t make mashed potatoes. And silly me, I thought, no big deal. We have two kinds of stuffing, green bean casserole, and all the staples right? Nobody will miss mashed potatoes. WRONG!!!! So, so wrong. Hindsight, I should have made one batch of stuffing and made sure to have the potatoes. Apparently mashed potatoes are a thing. I didn’t know, but man I do now! At a party you need to have something for people to do of they’ll leave. It’s just truth. You’ve gotta get them sucked into a game or activity. I decided on poker for Friendsgiving. We did a $5 buy in and anyone could play. We started soon after dinner was over and everyone had a blast. I didn’t play because I was already playing hostess, and that’s the funnest game I’m aware of. Truly! If poker isn’t something you’d like to play you could also try Cards against humanity, Pictionary, Escape room in a box, Apples to apples, and the list goes on and on. Find something you think your crowd would appreciate. You’re with only those YOU invited! Your closest friends. Enjoy the time with them and cherish the memories you’re making throughout the night. Take a moment to look around and appreciate each and every person during your party. These are your people. 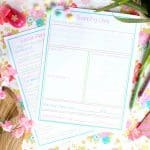 Need something to help organize your thoughts and ideas? 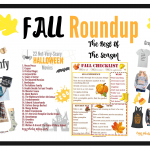 Enjoy this free printable when planning your next party! this is so awesome. 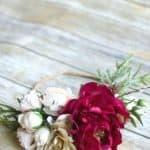 I’m hosting one this year so this is so helpful! Such cute ideas!! Love the banner!! We’ve been saying for years that we want to host a Friendsgiving…now I’m really feeling inspired. Love this decor! I’m in love with that banner! It’s so perfect! I also love the potluck idea too. I’m always the one trying to cook everything! It would definitely make the day more enjoyable! You have given some great tips – especially about assigning food. This is inspiring me to maybe plan a Friendsgiving next year! It was so fun to host! You’ll love it! That Friendsgiving banner is so cute!